Difference between revisions of "Škoda Rapid (NH3)"
'''Škoda Rapid (NH3/NH1). 2012 to date (prod. n/a). 5-door notchback saloon, 5-door saloon. F/F, 1198 cm³ (I3 DOHC), 1197 cm³ (I4 OHC), 1390 cm³ petrol, 1598 cm³ diesel (I4 DOHC).''' Another year, another Rapid, though this version, unlike the [[Škoda Rapid (6R)|6R]] model sold in India, comes out of the Czech plant and is aimed at other markets, including the west, and China. Twinned with the [[SEAT Toledo (MQB)]] and built on the same lines. Despite shape, not a notchback, but a hatchback, fitting in between [[Škoda Fabia (5J)|Fabia]] and [[Škoda Octavia (1Z)|Octavia]], though fairly close to Octavia size, with same boot capacity. 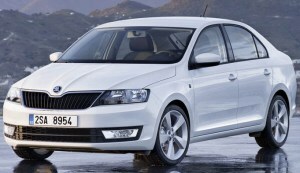 Comfortable, with good ride, and light steering, which meant body roll, but Škoda targeted the Rapid at families. More conventional hatchback (NH1), dubbed Spaceback, from 2013, built also in China, but Chinese Rapid saloon was a variant of the [[Volkswagen Santana (NF)]]. '''Škoda Rapid (NH3/NH1). 2012 to date (prod. n/a). 5-door notchback saloon, 5-door saloon. F/F, 1198 cm³ (I3 DOHC), 1197 cm³ (I4 OHC), 1390 cm³ petrol, 1598 cm³ diesel (I4 DOHC).''' Another year, another Rapid, though this version, unlike the [[Škoda Rapid (6R)|6R]] model sold in India, comes out of the Czech plant and is aimed at other markets, including the west, and China. Twinned with the [[SEAT Toledo (NH)]] and built on the same lines. Despite shape, not a notchback, but a hatchback, fitting in between [[Škoda Fabia (5J)|Fabia]] and [[Škoda Octavia (1Z)|Octavia]], though fairly close to Octavia size, with same boot capacity. Comfortable, with good ride, and light steering, which meant body roll, but Škoda targeted the Rapid at families. More conventional hatchback (NH1), dubbed Spaceback, from 2013, built also in China, but Chinese Rapid saloon was a variant of the [[Volkswagen Santana (NF)]]. Škoda Rapid (NH3/NH1). 2012 to date (prod. n/a). 5-door notchback saloon, 5-door saloon. F/F, 1198 cm³ (I3 DOHC), 1197 cm³ (I4 OHC), 1390 cm³ petrol, 1598 cm³ diesel (I4 DOHC). Another year, another Rapid, though this version, unlike the 6R model sold in India, comes out of the Czech plant and is aimed at other markets, including the west, and China. Twinned with the SEAT Toledo (NH) and built on the same lines. Despite shape, not a notchback, but a hatchback, fitting in between Fabia and Octavia, though fairly close to Octavia size, with same boot capacity. Comfortable, with good ride, and light steering, which meant body roll, but Škoda targeted the Rapid at families. More conventional hatchback (NH1), dubbed Spaceback, from 2013, built also in China, but Chinese Rapid saloon was a variant of the Volkswagen Santana (NF).